SAN JOSE — At least three people were home — two brothers and a sister in their teens and early 20s — when a single-engine airplane crashed into their house Sunday afternoon in a busy subdivision, barely two blocks from Reed-Hillview Airport, injuring all three on board, but hurting no one on the ground. “I was watching TV and I heard a loud sound. The house was shaking,” said the 22-year-old brother who didn’t want to give his name, but said no one was in the front room at the time of the crash. The siblings ran outside, and with neighbors who rushed over, helped pull the young man and two young women from the plane, he said. Two suffered major injuries in the crash. The pilot, who had just taken off from the airport just before 3 p.m., reported a “system failure” and was turning back when it crashed into the home’s front converted garage, said San Jose Fire Capt. Mike Van Elgort. The plane barely missed power lines and rooftops and parked cars before plowing through a rose-covered trellis arching over the driveway and slamming with it into the house. Only the nose of the plane crashed into the front room, but the exterior wall buckled under the force of it. The wings — and the remains of the broken trellis — stopped the plane from propelling deeper into the house. The small plane wasn’t traveling much faster than a vehicle, he said, probably between 30 mph and 50 mph at the time. As many as 13 people live in the house in the 2100 block of Evelyn Avenue, near Capitol Expressway and Ocala, he said. While most of them weren’t home, he said, it could have been much worse. The 22-year-old who lived in the house was the first to race out to the bloody scene. All three in the plane were taken to area hospitals. Two were in critical condition and one suffered minor injuries, Van Elgort said. Neighbors were outside barbecuing, watching the Raiders game or pulling into their driveways when they heard the sputtering, then saw the crash. Santos, who has taken a first-responder course, told his buddies, “I gotta go. Let’s go,” and they rushed to help. Gasoline was pouring out of the plane. Two of the victims were covered in blood, he said. One of the women had been laid out on the property and appeared to be in and out of consciousness. Tom Brimer, 48, had just pulled up to his house a few doors down when he saw the plane flying low. “Wait a minute. 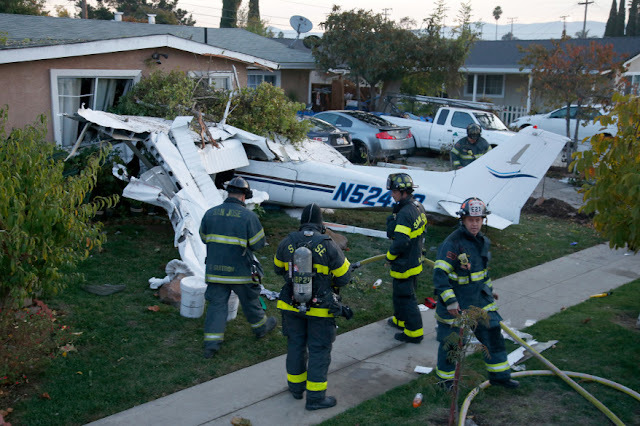 That plane’s not going to make it,” he said, just before it nose-dived into the house. It isn’t clear yet who was flying the fixed-wing Cessna 172 aircraft, or how much experience he or she had. The Federal Aviation Administration and the National Transportation Safety Board are investigating. The plane is registered to San Jose-based McClelland Aviation Inc.
All 13 people who lived in the house were displaced. Photographer Karl Mondon contributed to this report. 0 Response to "San Jose plane crash: “The house was shaking,” three injured"